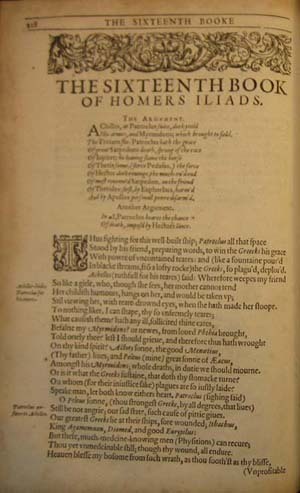 Homer's Iliad, translated by George Chapman (1616). 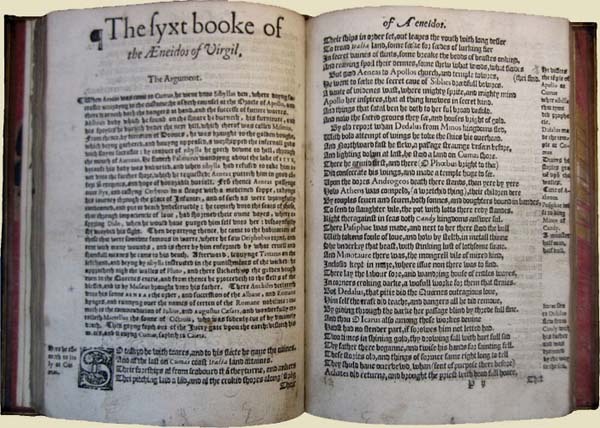 A rather often stated paradox about Milton is that, in creating one of the most seminal works in the English canon, he pushed the development of literature forward whilst looking backwards - to the Civil War, to his precedents in English epic, to the classics and ultimately to the Bible. The poem celebrates that which is lost in both subject-matter and Milton's use of language; like Spenser before him, he resuscitated archaic words, formed new Latin-sounding creations and wrote in a syntax and grammar that is convoluted, and has never been easy to read. It is comforting to think, when reading Paradise Lost, that generations of readers and critics before you have got lost in its verse-paragraphs, have struggled to identify where on earth the verb actually is. Because of its anachronism and highly 'poetic' style, T.S. Eliot famously described Paradise Lost as an undeniably great work that had, however, held back English poetry for years: even in the twentieth century, it represented 'an influence against which we still have to struggle'. Just as the poem confronts both the danger and the romance of revolution, it was forged from the influence of previous works into something at once new and reactionary, pushing forward whilst looking back. The second line seems almost like a joke, a trick on the reader. Homer, Virgil, Dante, Chaucer and Spenser (amongst many others) all opened their epic poems with prayers for help from the Greek Muses, the goddesses who embodied and inspired the arts and those who practiced them. Whilst to later, Christian, poets there is always a hint of Christianity read anachronistically into these pagan invocations, Milton here catches the reader out by subverting convention and making it explicitly Christian: the 'secret top' is not of Parnassus, the home of the Muses, but of 'Oreb, or of Sinai', where Moses received the Ten Commandments. A studied, conventional archaism becomes in Milton's hands not just a requirement of the epic form, but a tool to show his relation to it: he desires to soar 'Above the Aonian mount', to surpass rather than merely to follow the epic tradition. In some ways the invocation can be seen as a conscious act of rebellion, even in its imitation of previous conventions: Milton not only 'blasphemes' against the Classical tradition but also, in invoking Christian divinity, makes a bold gesture. Contemporary theological and poetic theory saw Christian invocation of God as over familiar, as poetry was considered by some an unsuitable place for prayer. The whole invocation is a kind of collage, putting the Biblical 'in the beginning' in a setting that seems borrowed in style from the Italian epic poet Dante. Significant, too, in our understanding of Milton's relation to his poetic forefathers is line 16, where he promises to pursue 'Things unattempted yet in prose or rhyme'. Ironically, this line staking a claim to new ground is actually a translation, and a very literal one at that, from Ludovico Ariosto's Orlando Furioso, another incredibly influential Italian epic ('Cosa non detta in prosa mai, né in rima'). What we have here is an intense self-consciousness of style and of genre: where Chaucer, in Troilus and Criseyde, sidesteps the issue of the morality of invoking a false God, Milton seems to investigate even the most conventional aspect of his form and tune it to his own ends. The invocation uses fragments of other work to fit a conventional shape to make a picture that is altogether new. It is here that we find the answer to the paradox of Milton's revolution in being reactionary: the first truly Christian Epic. Virgil's Aeneid, translated by Thomas Phaier (1573). It is worth considering what exactly we mean by 'epic' poetry - how much we can gain from thinking about Paradise Lost as an epic, and how fixed the 'rules' of genre really are. Milton was clearly interested in regulated literary form and the distinctions between genres. In some ways, he represents the end of a certain trajectory in English literature as well as the beginning of one: he wrote his sonnets decades after the form's heyday, his pastoral Lycidas well after the late sixteenth century fashion for the genre, and his great epic Paradise Lost nearly eighty years after Spenser's definitive English epic The Faerie Queene. Literary critic Colin Burrow has described the publication of Milton's poem as 'deliberately untimely'. It's clear that Milton was not merely following literary conventions and fashions, but rather reviving and re-evaluating the judgments made by Renaissance literary theorists like Sir Philip Sidney, and classical philosophers like Aristotle. We could spend a long time worrying about the exact definition of the epic, but it can be summarized quite simply: most of the time, an epic is what announces itself as such by its length and generally grand scope, and its conformity to several conventions. Not all of these need be in evidence, and epic seems generally a less regulated form than pastoral, comedy or dramatic tragedy. Most epics, however, have a strong single central character, a scope that encompasses various locations and often includes elements of the supernatural or divine, a narrative opening in media res (in the middle of things), and use long, rhetorically formalised speeches rather than the more naturalistic speech found more often in drama. 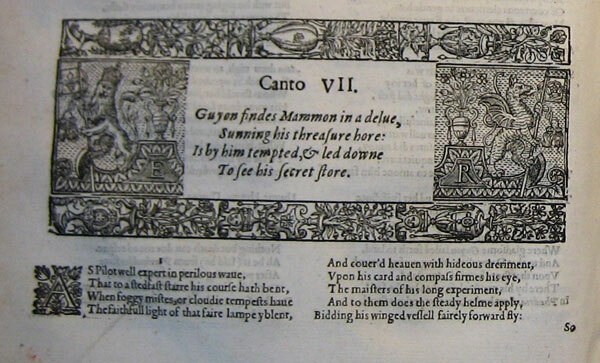 Book II, Canto VII of Spenser's Faerie Queene (first published in 1590). Milton was by no means the first poet to set Christian matters in the epic frame: in the fourteenth century, William Langland's Piers Plowman presented Christ as a chivalric knight fighting for mankind, while in the 1590s Spenser wrote into The Faerie Queene (amongst endless Christian and philosophical allegories) an allegory where the Redcrosse Knight is both St. George and Christ, linking medieval romance to biblical allegory and to neoclassical epic. But in Milton we do not merely find a redeployment of the epic form to Christian ends: he at once provides English Literature with its most perfect epic (students and academics will argue the comparative greatness of Spenser and Milton for centuries; but where The Faerie Queene is idiosyncratic, singular and unfinished, Paradise Lost fulfils most of the requirements for a 'proper' epic), and essentially kills off the form. As an example of Milton's simultaneous use and subversion of epic convention, we need look no further than Milton's Satan cast as epic hero. That he is the 'hero' of the poem is undeniable in as far as he is its most present character, the figure we follow most often and the progenitor of the poem's main action. Perhaps the tendency for generations of readers to find him sympathetic is actually a result of our conventionalised response: we find him heroic because of the perspective that comes from his role, because he is given the chance to speak at greater length than others and because he is the subject of conventions fitting for a hero (his spear, for example, is described at length, just as Homer famously describes Achilles' shield). The material and form of the poem cannot be seen as two separate edifices: we find Satan heroic because Milton has decided to write this tale as an epic poem, and so we align Satan with other, earlier heroes and respond to the accepted conventions of the genre. So Paradise Lost is both a consummate example of Milton's literary heritage and scholarly interest in form, and an anti-epic, seeking to surpass, rewrite and rethink that which has gone before. Do we find Satan noble just because he is the hero of Paradise Lost, or was he written as the hero because Milton thought him noble? Can we be tricked into false moral judgment by responding to convention, by treating the Bible like other literature? Does generic literature (and all literature is to some extent generic, even if that genre is 'The Novel') always have certain moral judgments or sympathies implicit in its conventions? These are all questions that Milton confronts when he uses the epic form, and ultimately we must follow his example in reading the poem: there is no authoritative voice in Paradise Lost. If we see even the voice of the narrator as an exercise in form, then we are faced with the ultimate significance of Paradise Lost as Christian epic: the revelation of the power of the form and of poetry to bewitch the reader by its majesty and its associations to previous works, but also the imperative of its readers to think beyond what they are told, to read critically and to be aware of the implications of form and genre. provides a useful overview of how millennia of poets have interpreted the form, and is useful for thinking about Milton's place as a crossroads, ending one tradition of literature and forcing a crux in the development of the canon. is notorious, and worth reading with a critical mind: it looks at Milton from both sides, and places him at the centre of a larger theory of how poets influence one another.